I've just completed a baby quilt for my great nephew, who should be arriving in a few weeks. Very long weeks for his mother! 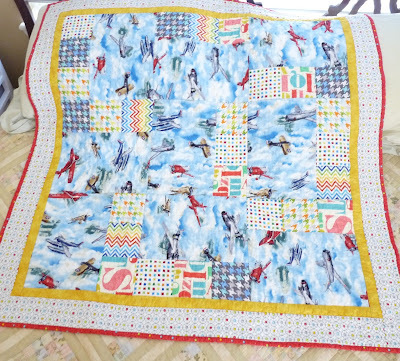 She is decorating the room with an airplane theme so I manage to find this nice fabric with several different realistic airplanes on it. I'm not a big fan of the stylized images so often found in baby fabrics. Since all of my fabric stash is in storage, I went into a local quilt shop and asked for help. The very helpful staff member showed me several books and helped me pick out all the accent fabrics, and I bought just enough for the quilt, no extra as I usually end up doing. The pattern is "Surf's Up Baby" from the "Big Book of Baby Quilts", available on Amazon. This monkey print is pretty cute, so I used it for the backing. The quilt is all quilted, washed, and ready to go to the little bundle of joy! I mentioned above that I went to a local quilt shop. Here in Northern Colorado there are five within about 15 miles, whereas when I lived in South Orange County in California all the local shops closed in the last few years. I can't get over how nice it is to walk into a fully stocked quilt shop that has so much to choose from. Heavenly!